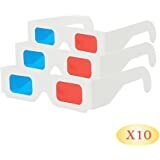 We got these to watch movies with...so...I read a lot of reviews ,and was a little concerned about them as a lot said they didn't get what they ordered. Ours were the brand shown,no effort to wear and fit perfectly over my fiancé's glasses which was the reason for getting these,we haven't watched anything yet,but we were told DEC.20th-january 12th.we got them today,December 6th. So loved that as we didn't expect them for at least another couple of weeks although we ordered them a few days before Thanksgiving! He was so excited when he came home to find them super early. They are comfortable and there is the clear on the sides..but it didn't bothrt me with lights on although I didn't have but a soft toned light on in the room. I'm trying to help teach my brain to get along with my slightly lazy eye. My brain doesn't combine the left and right eye together fully as I have a 20/20 left eye and a 20/200 (yes that's 200 or I see at 20 ft what most people see at 200, trust me its horrible) right eye. With so much imbalance the two eyes don't work together and the left eye takes almost complete control of my vision. These glasses come into play as I've read that training the eyes to work together through color-coded games (red - blue so only 1 eye see's the objects at a time) can help a lazy eye stay still and for the brain to combine the images from both eyes correctly (With the help of corrective lenses of course). 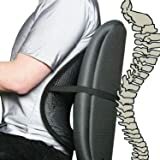 The product itself is sturdy and seems well-made and for my application it works well, thank you! 3.0 out of 5 starsGood enough for the price. The glasses I recieved aren't Nvidia branded as pictured and the blue side is a little darker as well. Regardless they work fine on the things I needed them for and fit comfortably over my prescription glasses. 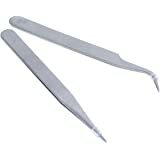 They're cheap, they're not painful to wear for an extended period and they do what they're meant to do. Just don't expect much out of anaglyph 3D which was never that great to begin with. 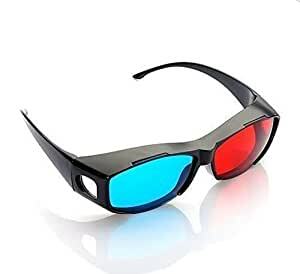 For anyone with glasses who has tried to use those 3D glasses packed in with movies, you know they're a total pain to wear. You usually end up trying to stick it over your glasses and stretch it around, and it never fits right, never stays in place and just feels horrible. These glasses fix that problem. 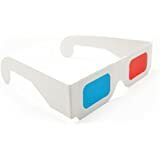 These are more like traditional sunglasses (and anaglyph 3D sunglasses-style glasses are nothing new.. but these actually stick out a bit further, so your regular glasses fit inside them. The lenses are also very large, so you don't get the "light leaking" from the lenses themselves. The quality itself isn't the greatest. I feel as if I try to open it too wide, or drop it, the pair is done with. The positive of this is that it's pretty lightweight, so you don't get that "poking" feeling. What I considered a downside are the 2 clear plastic holes (one on each side) - I'm guessing these are to make it easier to see if someone is coming up on you, but I found it to just allow light in and cause distractions (everything you see if red/blue, except for on the very sides of your head). This can be "fixed" with duct/gaffers/electric tape if you need to. A lot of people are commenting about the actual shades of red/blue (cyan). Mine were very accurate and nearly identical to my "paper" glasses. Mine also had a NVIDIA 3D VISION logo on the side, but I highly doubt these are nvidia -- the logo appears to have been put on very poorly with paint (a stamp?) as it's smearing as if they were stamping these quickly and moving them before they had time to dry. Overall, works great.. quality could definitely be better though. 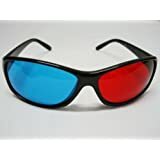 One other thing to note - if you're using this for movies, check which type of 3D glasses yours needs. A lot of newer movies are using the green/magenta colored glasses, and these won't work. The image and the actual product are not very similar. The glasses I received are not an Nvidia product. The filters are made of a thin film of plastic rather than lenses and loose in the frame. 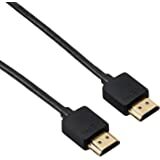 Considering the price of less than 2$ I feel like I did get a fair value and they do work with Nvidia 3d Vision on my system. In the end though, I probably won't use these or 3d Vision. Perhaps the full active glasses from Nvidia rather than Cyan/Red filters are better. The 3d still images though are impressive enough I would use these for that purpose. Your experience may very based on your system and monitor.